"musubi cafe" is located close to Togetsukyo in the Arashiyama sightseeing area. Visitors to the cafe can sample meals and sweets made using healthy Kyoto ingredients. I recommend trying the set menu that includes both meat and vegetables, but there are also vegetarian options available. The wooden interior creates a sense of warmth and freedom. Some of the tables also have a bench seating in addition to chairs. This is great if you are taking children. The café is open for both lunch and teatime, which is an added bonus. And lastly, the café also boasts a shower room complete with lockers. If you work up a sweat taking in Arashiyama by bicycle, you should definitely pay musubi cafe a visit. This is a set menu that primarily uses local Kyoto ingredients and offers both meat and vegetables. The dishes use little salt and are seasoned in a way that emphasizes the flavor of the ingredients. The set includes both a main and side dish, pickles, miso soup, and the rice of your choice (either brown rice or mixed grains). The food served in the set changes daily. This pasta dish aimed at vegetarians bases itself on the sweet flavor and fragrance of tomatoes and fried onions. It also uses little salt and goes down with ease. Mushrooms and pumpkin are also used in the dish, allowing a variety of different textures to be enjoyed. It's cooked fresh and comes out hot, so take care not to burn yourself! The cake has a cream made from tofu and matcha. It has a light flavor and showcases the perfect balance between matcha's mellow aroma and the fragrant scent of kinako (roasted soybean flour). If you want to make it a little sweeter, you should eat it together with a little anko (bean paste). There is an English menu available with simple explanations of the dishes. A decent selection of alcohol that includes sake, shochu, wine, and whiskey is also available. If you have any problems, have a word with the staff. They are bound to offer you a friendly response. If ordering food during lunch time hours (11:30am-3:00pm), you can add a coffee, tea, or Japanese tea (hot or cold) for an extra ￥250. Located near the Hankyu Arashiyama Station is a healthy vegetarian cafe that uses mainly Kyoto ingredients. The restaurant presents itself in a warm and lovely style. 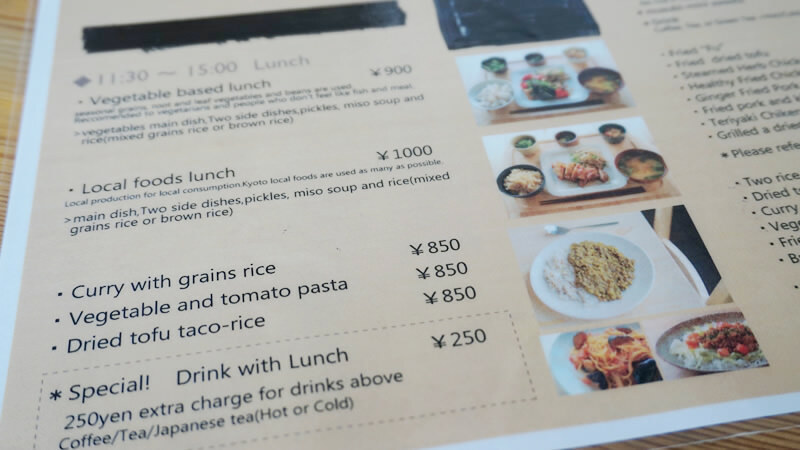 In addition to the daily specials, you can also choose from either curry rice or pasta. If you wish to have afternoon tea, we also recommend the tofu dessert. If you are tired from the hustle and bustle of the city, come here, relax, and take a break from it all! I recommend a visit to musubi cafe after becoming hungry and tired while sightseeing around Arashiyama! There you can enjoy delicious food using quintessentially Japanese ingredients, take a breather, and even have a shower and refresh. The staff are cheerful and friendly too! It's a great spot that you can visit with ease on your own or in a group. 3-minute walk from Hankyu Line Arashiyama Station. 7-minute walk from Keifuku Line Arashiyama Station. 10-minute walk from JR SagaArashiyama Station.